Body Transformation: Raphael Gabiazon Lifted His Body Into The Stratosphere! Raphael had little purpose in life until his ripped uncle introduced him to bodybuilding. Now he lives with passion, self-discipline, and pride. See how you can too! For most of my elementary school years, I was the fat kid that everybody teased and bullied. When I ate lunch, I was teased about my weight. When I participated in gym class, I was told how unhealthy I was. When I wore new clothes, I often got comments on how large I was. Having this happen almost every day affected me physically and emotionally. At age 13, I went to my uncle for tips on how to lose weight. People know him as Kane Sumabat or Timberwolf on BodySpace. Kane gave me tips to lose weight and put me through a workout that fatigued me for days. Seeing my uncle work out and push his limits to get stronger during every workout made me realize that I should aim to be the best I can be. A year and a half later, I lost 20 pounds and gained lots of muscle. Now I&apos;m 123 pounds at 5-foot-5 with 8 percent body fat. I continuously work out four days per week, track my macros, and take supplements. Under my uncle&apos;s guidance and support, I surpassed my original intended goal. I look and feel better and inspire people try their best in every challenge. At age 45, my uncle Kane looks better than most people in their prime. Thanks, Uncle Kane, you taught me to be my best. I never worked hard and always procrastinated before. I wasn&apos;t my best and didn&apos;t care about anything until I discovered bodybuilding. Bodybuilding pushed me to my limits, made me work hard, and forced the best of out me during every workout. It made me realize I was missing key components in my life like self-discipline, patience, and a strong work ethic. Adding those traits to my life helped me achieve my goals in all walks of my life. A year and a half later, I lost weight, made gains, and looked better. It made me a better person; the person I should&apos;ve always been. I follow the IIFYM (If It Fits Your Macros) diet with no specific meal plan. The only thing that matters is that I hit my macros. Here&apos;s an example of my lean bulk day. "Never compare yourself to others." Motivation was my largest obstacle. I didn&apos;t get much support outside of what my uncle provided. People often said I should stop dieting and working out because they didn&apos;t see progress. I learned to overcome relying on support and used myself as motivation to be my best and show to people I can achieve my goals. I plan to continue bodybuilding and compete in physique when I&apos;m older. Most importantly, I want to look good until I&apos;m old like famous bodybuilder Serge Nubret, who looked amazing at age 70. I wouldn&apos;t mind being a fitness model on the cover of Muscle & Fitness. Be the best of what you can offer! Have knowledge of different diets and exercises. 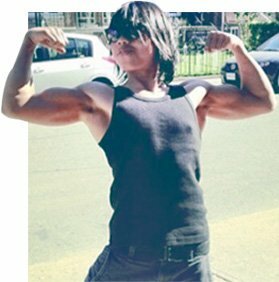 Bodybuilding.com Forums helped me learn and expand my dieting and fitness knowledge. The forums are a database containing everything you need to know.